Fish has always been one of the most important sources of protein in the human diet, and is now becoming more important than ever. In ancient times, fish were caught with hooks made of bone or horn. Later nets made of natural fibers were invented to catch fish more efficiently. Cages and traps made of wood, bamboo, tree bark and grasses were also used. Compared with modern fishing techniques these early methods were all very primitive. Nowadays, nets are used all over the world, from very small-scale fishing done from canoes, to the very large-scale operations such as deep sea trawling, which require a large vessel. 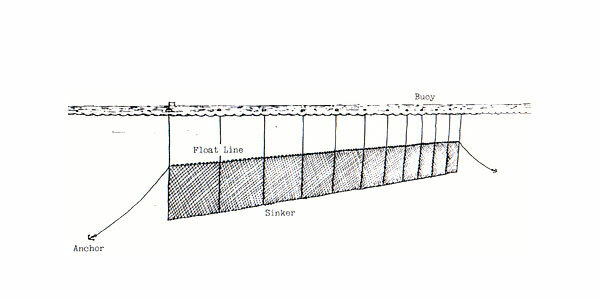 Lengths of gill netting are extended in the water as vertical walls as netting. Schools of fish in the area, attempting to swim through the netting, are entangled in the meshes and caught. 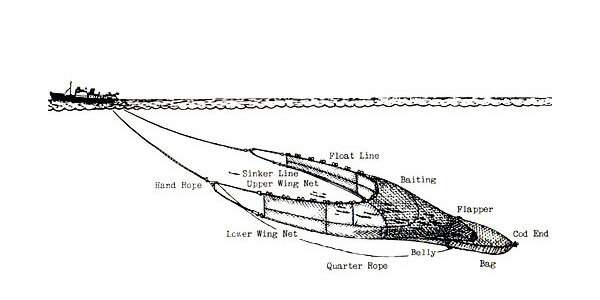 "Floating" gill nets (drift nets) are used near the surface and "bottom" gill nets are used for catching fish near the bottom. Salmon, cod, and trout, among other species, may be caught by this method. One or two fishing boats carry the net to the fishing ground. Once there, the net is lowered into the water. A school of fish is then surrounded by the net. Because the bottom of the net is closed (pursed), the fish are trapped in the net. Sardine, mackerel, boito, and tuna, among other species, may be caught by this method. To surround a school of fish a single boat is used. After the net has been places surrounding the school, fishermen on the beach haul in the "wings" of the net. As the net approaches the beach, fish are driven into the "bag" and are hauled up on shore. Sardine, mackerel, Spanish mackerel, hard tail, sea bream and flat fish, among other species, may be caught by this method. 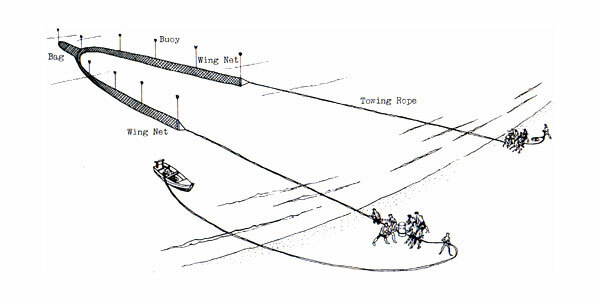 The trawl net is dragged through the sea behind a trawling vessel. 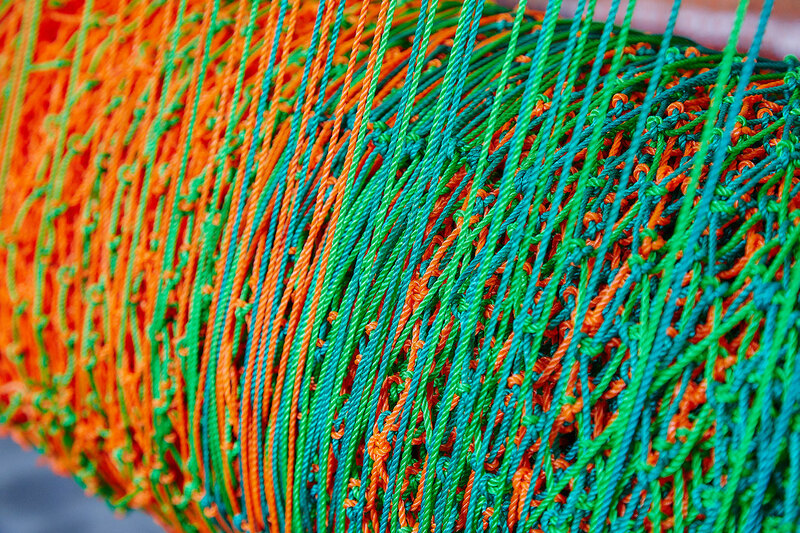 The net is attached to the ship by long ropes. The mouth of the net is kept open through the action of a pair of "otter boards" attached to the leading ends of the net, or in some cases, through the dynamics of the current passing through the net. 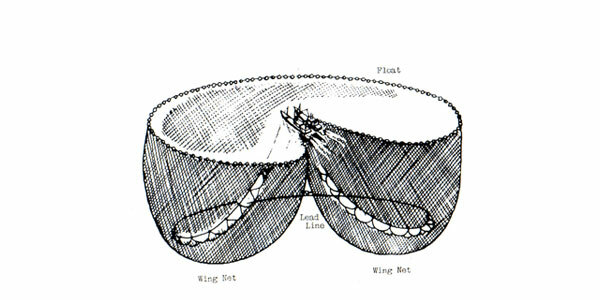 Alaskan pollack, sea bream, and sole, among other species, may be caught by this method. 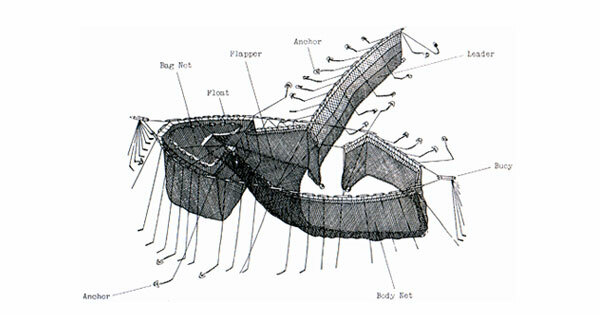 Fish are guided into the "body net" by the "leader", enter the tunnel of the "flapper", and are finally trapped in the "bag net". Sardine, mackerel, yellow tail, tuna, and squid, among other species, may be caught by this method.